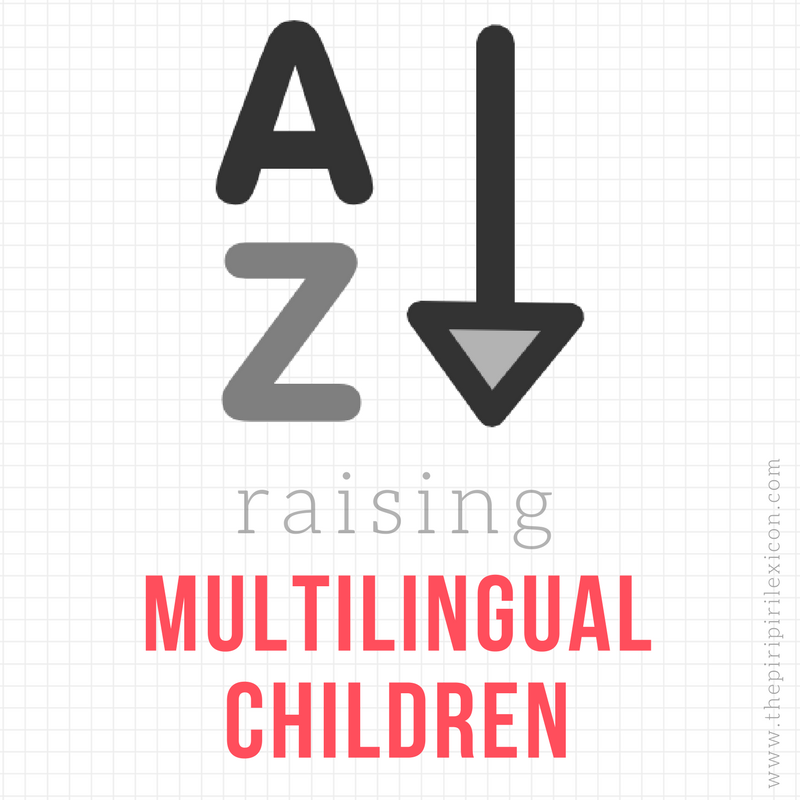 Is your child multilingual learning to write? 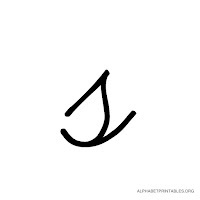 Is s/he interested in letters? Does s/he ask you what a Y is when you tell him Yoda starts with a Y? Mine does all the time and we have found the perfect solution. Learning to write when your multilingual can be confusing. Letters have different labels and sounds depending on what language your are learning. One day last winter, someone forwarded me a message about Una and her Kickstarter project: a multilingual alphabet for children learning more than one language. I just took a quick look and backed it straight away. It was genius idea. And I don't regret it. LJ, 5, is at a stage where she is starting to ask about how to write this and that. She knows some letters of the alphabet but not all. When she asks me how she can write Papy (grandpa in French) for example, I tell her the letters one by one. 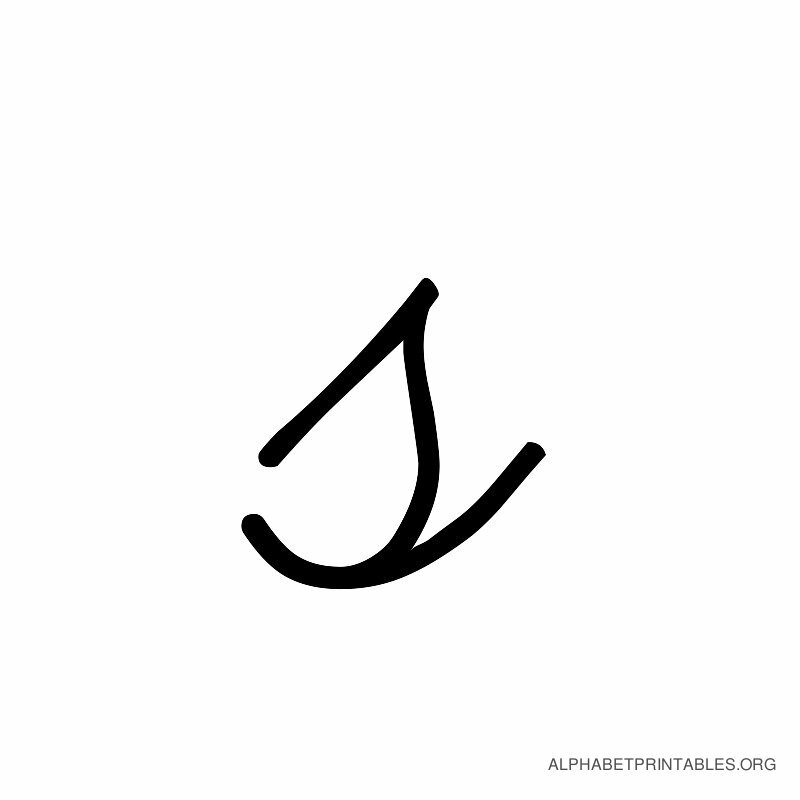 But she often asks what is a Y. I used to have to draw the letter myself or show her on something I have at hand. Now, I can just say Y is for Yoga. And she goes off and looks at her little alphabet pinned to her wall. The only tricky bit for me now is to remember what letter is for what word, but I am getting better at it! The amazing thing is that this alphabet works for all of our languages: Portuguese, French, English and German. (It also works in Spanish and Dutch.) So whether she asks about writing Dienstag or butterfly or obrigada, we use the same alphabet and the same reference words. It is genius. 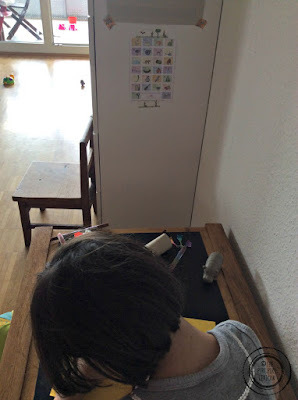 It also helps her find translations for the words on the card in her weakest languages. For example, P is for princess (en), Prinzessin (de), princesse (fr). But she now knows in Portuguese it is also princesa. The little alphabet comes in different forms: a little card, a poster. There are also printables and dominos. You can find out more over at Love Your Lingo. The only negative side to the alphabet is that the letters are written in capitals and smaller script letters. LJ is learning capitals first (as they do in Germany and France) so that is great. But we would like to teach her handwritten/cursive style letters next (as taught in France at least). So for me a lower-case cursive l or s would not look like they do on the card. They would look like the one on the left. I know this is going to come up as an issue when she starts writing lower case letters at school. But we are not there yet. 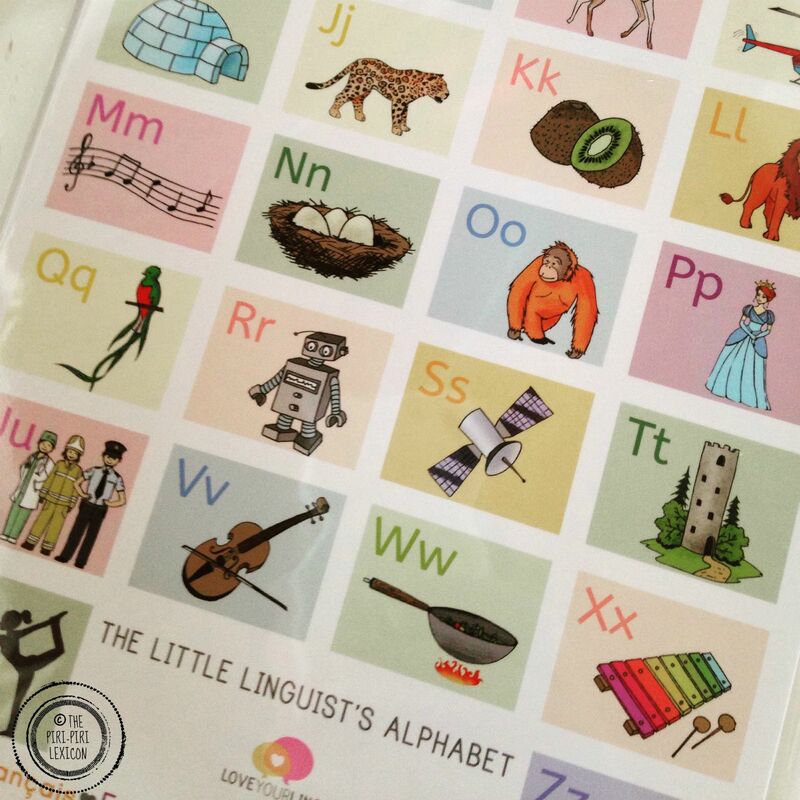 Of course, the alphabet is only good if your child is learning some of the languages included in it. I believe there are plans to include Italian too. This is NOT a sponsored post! All opinions are my own! I love this! I'm going over to check it out on Kickstarter. 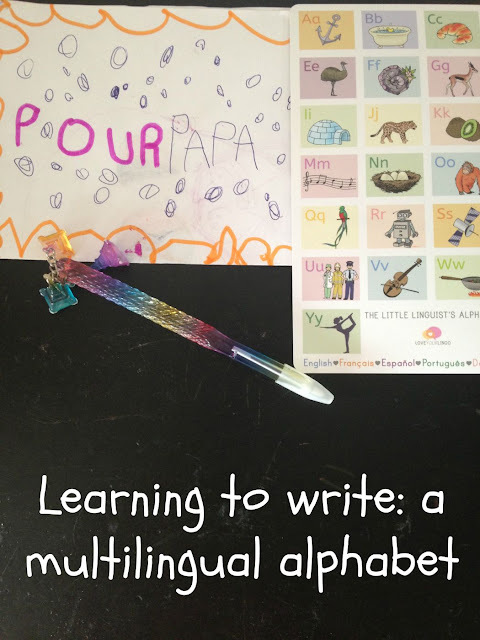 My kids are bilingual in English and Spanish (with some Indonesian thrown in) and this little alphabet looks just perfect for the oldest who is writing, in English at school and in Spanish with me. I know Una and her project of multilingual alphabet! I am waiting for the version which will include italian too as I teach English and French to italian children. It will look great in my new location in Milan! Sounds like a perfect fit for the you too. You know that I know Una in person??? Amazing how small the world is!! I'm waiting for her next version of the Italian-English alphabet! !